Animal Crossing™: amiibo Festival is a new way to play with your favorite Animal Crossing characters. Your amiibo™ figures are front-and-center in this party game, and you’ll get to use them with fun content. Bring to life an expansive and dynamic board game where the board is based on the months of the year like the core Animal Crossing series. The goal? Make your villager the happiest in town and party hard with your friends. 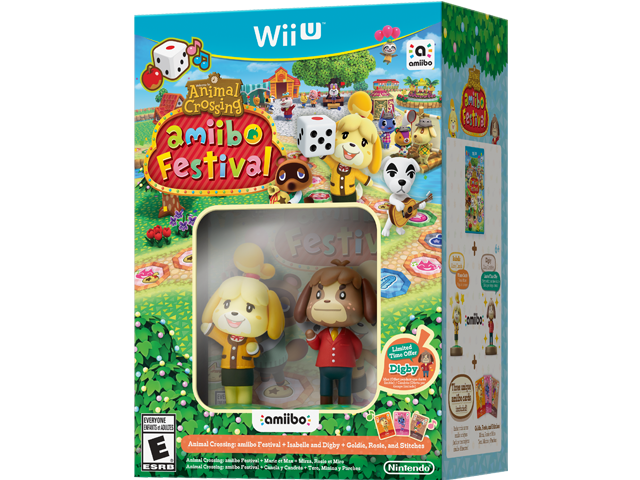 Includes Isabelle and Digby amiibo and 3 amiibo cards. Party with favorite Animal Crossing characters like Isabelle and Tom Nook—who have become amiibo. Experience the Animal Crossing universe in light-hearted board games based on the calendar, including the four seasons and seasonal events. Bring your amiibo to the party, collect Happy Points, play with your friends, and save your Happy Points to your amiibo to expand your own game even more. Use Animal Crossing amiibo cards in fun minigames.